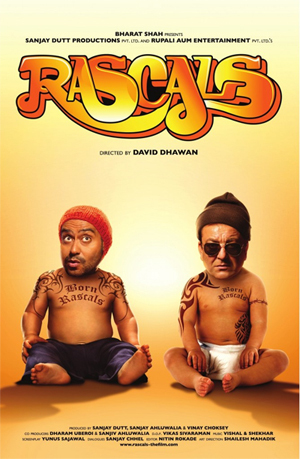 Rascals is an upcoming comedy directed by David Dhawan, starring Sanjay Dutt and Ajay Devgn as con-men competing to win the affections of Kangna Ranaut’s character. Described in the promotional material as a “mega-comedy”, if you’ve seen any of the trailers or even the poster, you’ll know immediately if the film is worth your pocket money: David Dhawan’s brash and energetic, super-colourful, super-loud, in your face brand of comedy isn’t for everyone, but it undoubtedly has its fans. Vishal-Shekar have certainly created a soundtrack to fit the Dhawan brief with the Rascals soundtrack – and by that, I mean that this album is basically an onslaught of high-energy noise from start to finish. The short album consists of four original tracks and two remixes; the entire album is heavily hip-hop and dance based. It’s definitely not one for old-school Hindi film music purists or fans of the rustic desi style currently making a resurgence. The title song sung by Neeraj Shridhan is…well, it’s what you expect from the title song in a David Dhawan film. It’s high energy and pounding and repetitive, and it’s full of funny sound effects, and a verse sung in chipmunk voices. It will either be hilarious while and after seeing the film (and this is totally the point of a song like this – it’s not really meant to be listened to in isolation, it’s meant to introduce the characters) or you will absolutely never – and I mean NEVER – want to hear this track ever again, unless you are actively trying to drive people out of your house. Just in case you DO have an odd urge to not only listen to the title track but actually get up and dance to it, the album includes Rascals (Dance Mix), which mercifully eliminates all the gimmicky effects (and the chipmunks) in favour of Neeraj Shridhan singing it properly over a paced up dancey backing. Pardaah Nasheen is a pounding, percussive wall of sound from the get-go, with Neeraj Shridhar belting out his vocals anthemically over the thumping, repetitive beats. Sunidhi Chauhan features all too briefly, adding a touch of sweetness – and we get the hint, all too clearly: this album is meant to be played full volume. There’s some crazy mixing going on in Tik Tuk – and I actually kind of like this one! There’s a hint of a bhangra beat and desi drums mixed in with choppy dance synths, sirens, sweet vocal samples from Monali Thakur and hip hop. Daler Mehndi’s repetitive staccato refrain anchors this hot, hypnotic mess, which might not be massy enough to be a huge hit but might just be different enough to make waves. If I’m honest, I have to say I found the rap in Shake It Saiyyan off-putting. Personally, I prefer the hiphop in the Breakaway soundtrack, which features some desi AND international hiphop integrated pretty seamlessly into a Hindi soundtrack. Hearing the awkward sounding rap in this track was like hearing a audible step backwards. The rest of the track is sparsely instrumented, thumping, loud, Sunidhi Chauhan sounds like she’s singing at the top of her comfortable range for a lot of it, and the overall effect is just kind of grating. I just didn’t like this one at all. There’s a “Hip Hop Remix” of the song is…misnamed, and manages to be even more irritating with the addition of handclaps and synthesisers. I basically never want to hear anyone ever implore me to “Swag it out” ever again. The Rascals soundtrack might be perfectly suited to the movie, and it might be ideal music for when you need some energetic background noise – but it’s ultimately filler. There’s not a lot of depth, originality or heart to it: in the end, it is just noise. A horribly disappointing effort from the normally solid Vishal-Shekhar; here’s hoping they saved their A game for Ra.One. 15 queries in 0.334 seconds.